We spent many a summer on the Penwith peninsula before we decided to make the big move to live here. During that time we loved cycling around the area, beach days and other attractions in the area. “But the roads are steep and the lanes are too narrow to cycle with young children” I hear you cry!!! Yes they are, I agree. 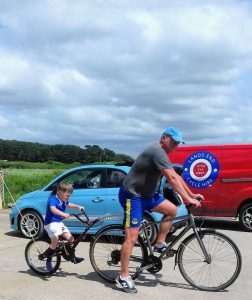 However there are rides that you can cycle with young families. 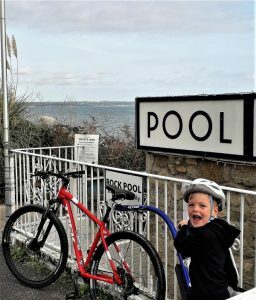 My favourite family cycle is the Mounts Bay Route. So we decided to take our 6yr old grandson, Riley, out for a day on the tag-a-long. This route is about 12 miles round trip, flat with just a few short, low level hills. Gaga got Riley settled by taking him for a few spins around the car park. He was then ready. I was on my Trek hybrid, Gaga and Riley were a duo. We left and went up and over the bridge. Riley was pedalling really hard. “Take your time Riley. We don’t want to go too fast and get tired”, I told him. I cycled closely behind so I could speak to him and point things out as we went along. They don’t know what they’re missing. Oh well they have their photo and can tick it off their “things to see” list. 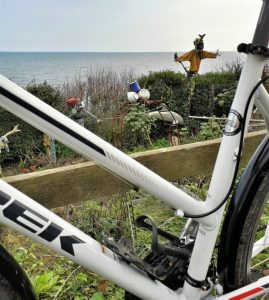 Cycling along the coastal path, I tell him to look out for dolphins and sharks. He doesn’t believe me. However they are they. 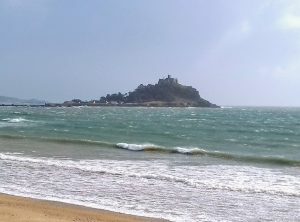 Over the weekend a basking shark was spotted very close in at Mounts Bay. 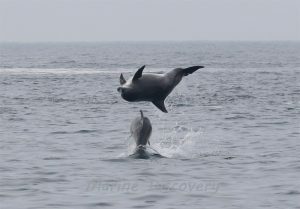 Duncan and Hannah from Marine Discovery have also posted several sightings of a pod of bottlenose dolphins in and around the bay. Going towards Penzance, we pass the train station and through the harbour ar park. We then joined the main road. This is a little bit nervy for him as it is the first time on a real road with traffic. Its less than 0.5 mile, so I told him he must concentrate. Its not a busy road, well not compared to most cities or big towns. This is a great way to get young ones familiar with roads and gain confidence. “Now keep focussed. Pedal. Don’t do anything sudden”. He knows he has to be serious and that he has to do as he is told. 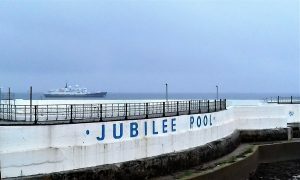 Once we get to The Jubilee Pool we were got off the road and cycled along the prom. Officially it’s not the cycle path but everyone uses. 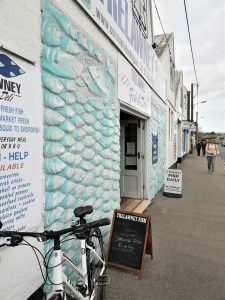 At Newlyn we pick up a pasty and sausage roll from Warrens Bakery. They are the best pasties in Cornwall and made in St. Just so keeping it local. We walked down to the end of the fishing harbour and sat there for a while watching the comings and goings of the harbour. Its a busy fishing town and Riley loved watching the boats. 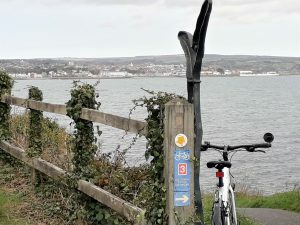 We continued along cycle route 3, up the small hill out of Newlyn towards Mousehole. “Pedal hard Riley. Help Gaga get up that hill”. His little legs moved so fast. If you could have seen his face as he helped. “Good work Riley”, shouted Gaga at the top of the hill, “We did it!!”. The route skirts round the harbour, past the fishing trawlers which have come in early that morning. 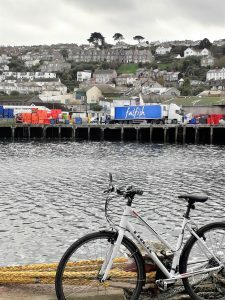 Oh the smell of fish is soooo strong as we cycle out of Newlyn. But Riley had to hold his nose! We took the path down from the road back along the coastal path. Reminding him to keep looking for those dolphins and sharks, a seal quickly popped its head up. 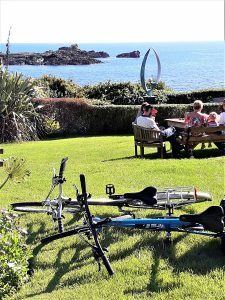 Its a bit rough this path and often when we go to Mousehole we don’t use it we stay on the Cliff Road which is just a lovely to cycle along. Gaga and Riley got off to push up the steep slipway and back up towards the road. 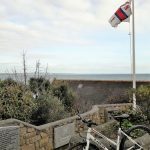 Cycling along the pavement, which is the official cycle route this time, we go past the Old Penlee RNLI Lifeboat station. 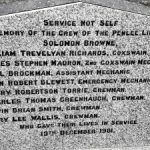 I told him the story of the disaster and why its an important part of the Mousehole Community. He seems to take it, a difficult one to understand at that age. Towards Mousehole we stopped to look at the quirky allotments. There is one in particular which is full of old bits and pieces, great to look at. Riley’s particular favourite is the dressed up mannequin and called it Jerry. 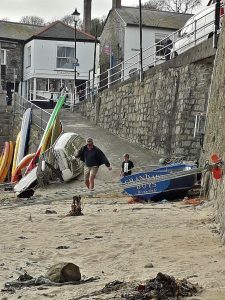 And then finally we reached Mousehole. We locked up the bikes by the harbour and ran down to the sandy beach (well Riley and Gaga did, I took my time). We stayed there for a couple of hours and then decided to have a quick drink at the Old Coastguard. (I think Gaga needed it before his ride back). Sitting in the garden looking out across the bay, we did some navel gazing, thinking how lucky we are to be living here. At the end of the day, as we handed Riley back to his mum, there was one very tired grandson and two shattered grandparents. A great day out. If you want to follow this route or other routes in the area then go to our Routes page for more information. Previous postWhat are these strange orange circles appearing in our Cornish lanes?